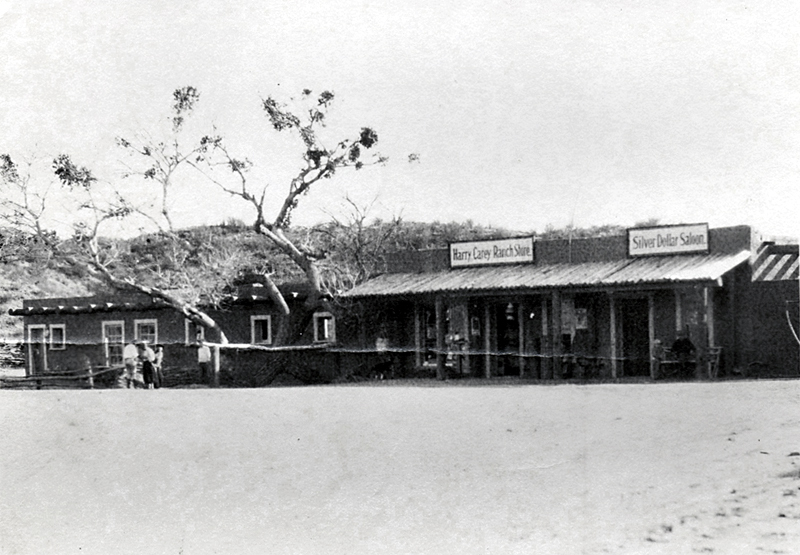 Harry Carey Trading Post in the early 1920s, showing the Ranch Store and Silver Dollar Saloon. It was located on the east side of San Francisquito Creek, between San Francisquito Canyon Road and the riverbed. It was destroyed when the St. Francis Dam broke in 1928. The flood killed the Careys' ranch foreman, Clinton Harter, and his wife Marian, as well as the Careys' cook, Solomon Bird. All three lived at the trading post, which Clinton and Marian operated. DC2301: 9600 dpi jpeg from brochure courtesy of Harry Carey Jr.